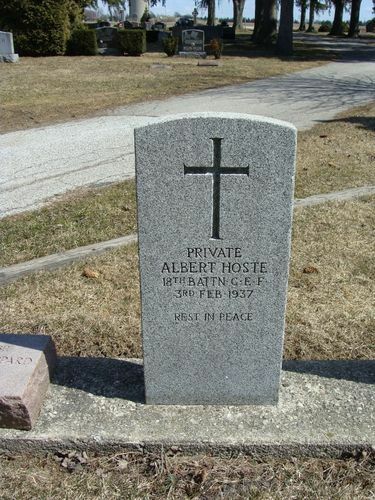 Hoste, Albert Service no. 189776. Contributed by a family member. 1911 Canadian Census There is no record of an Albert Hoste in Ontario for this census. January 3, 1916 Enlist with 91st Battalion Joins the 91st Battalion at St. Thomas, Ontario and lists his mother, Sophia Twisselman of Ostend, Belgium as his next-of-kin. February 28/29 1916 Transfered to the 186th Overseas Battalion Service card shows Private Hoste’s original reg. no. was 880211 and was changed to 189776 when he transferred to 186th Battalion. September 13, 1916 Camp Borden, Ontario Routine Medical Exam. Father: John Hoste, 49 Prince Albert Laan, Ostend, Belgium. Mother: Sophie Hoste, 49 Prince Albert Laan, Ostend, Belgium. February 23, 1917 Enters London (Ontario) Military Hospital Suffering from otitis media, an inflammatory disease of the middle ear. March 13, 1917 Leaves London Military Hospital Healed. Discharged to duty. April 1917 Assigned Pay Private Hoste assigns $15.00 per month to an account at the Bank of Montreal, Chatham, Ontario for himself. April 7, 1917 Bramshott, England Assigned to Segregation Camp, then to 4th Canadian Reserve Battalion. June 18, 1917 Struck off strength SOS 4th Reserve Battalion to be assigned 18th Battalion, France. June 17, 1917 Arrives 2nd Canadian Infantry Base Depot, Etaples, France Dating of the SOS above and this entry probably a clerical error. August 18, 1917 Arrives 18th Battalion Private Hoste was one of 23 men that arrived that night as reinforcements. December 22, 1917 Trench Shins Battalion out of the line at Villers Au Bois for rest and refit. Due to trench shins, Private Hoste is moved out of the line and goes to the 4th and then the 5 Canadian Field Ambulance for treatment. December 24, 1917 Trench Shins Transferred to 12th Canadian Field Ambulance. It is not apparent why Private Hoste is transferred to three field ambulances for his treatment. January 1, 1918 Trench Fever Transferred to No. 22 Canadian Casualty Clearing Station. January 3, 1918 Trench Shins Transferred to No. 18 Canadian Casualty Clearing Station. January 6, 1918 I.C.T. ( I.C.T. was a general term for suppurating skin diseases (Pyodermia), caused mainly due to parasitic disease, but did not include scabies.) Transferred to No. 83 General Hospital. July 11, 1918 Military Convalescent Hospital, Epsom Medical board reviews case and indicates Private Hoste is not fit for active duty for combat. The medical exam is concerned with a hearing impairment and the I.C.T. It does not recommend he be sent to Canada at this time. August 6, 1918 Witley Camp Posted to 2nd Canadian Convalescent Depot. September 7, 1918 Witley Camp Released from 2nd Canadian Convalescent Depot. September 9, 1918 Witley Camp Assigned to a Canadian Convalescent Depot. October 7, 1918 Witley Camp Struck of Strength and transferred to the C.E.F. in Canada. October 10, 1918 Arrives Quebec City Arrives from overseas and disembarks at Quebec City. Ship S.S. Cardiganshire. October 9, 1918 Probably London, Ontario Granted furlough without subsistence and this is later extended and subsistence is allowed. November 11, 1918 London, Ontario Medical Board convened and Private Hoste is classed Category “C” III and recommended for discharge. 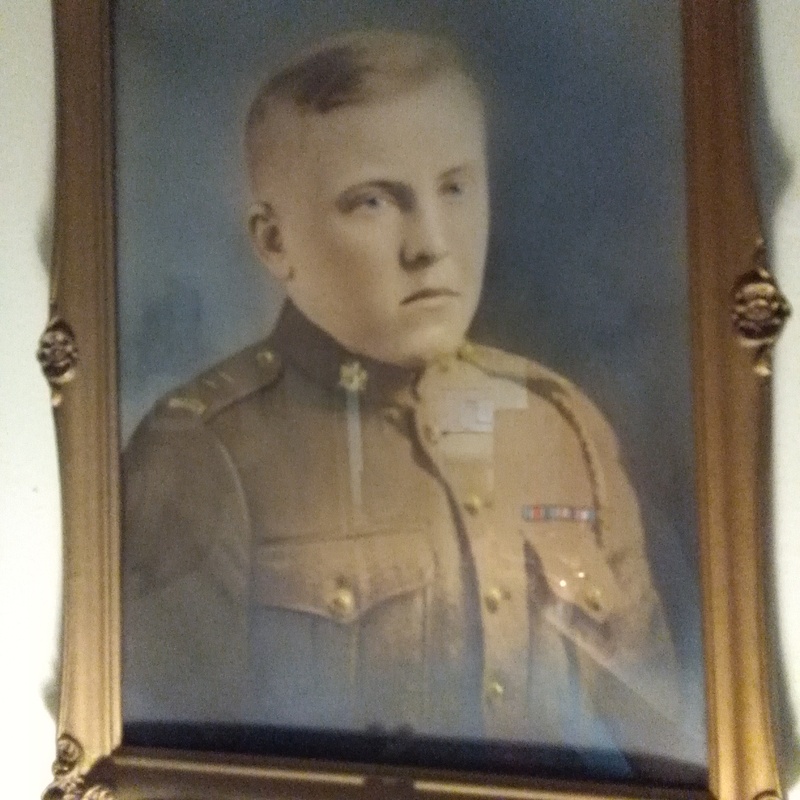 November 12, 1918 Discharged London, Ontario Private Hoste is discharged medically unfit. He has two tattoos, one of the left forearm declaring “Victory and True Love” and one on right arm with his name and a representation of a snake. His character and conduct is rated as VERY GOOD. February 3, 1937 Passed away. Buried at Riverview Cemetary, Wallaceburg, Ontario. Survived by Evelyn Hoste. Forever Remembered for his service to Canada.